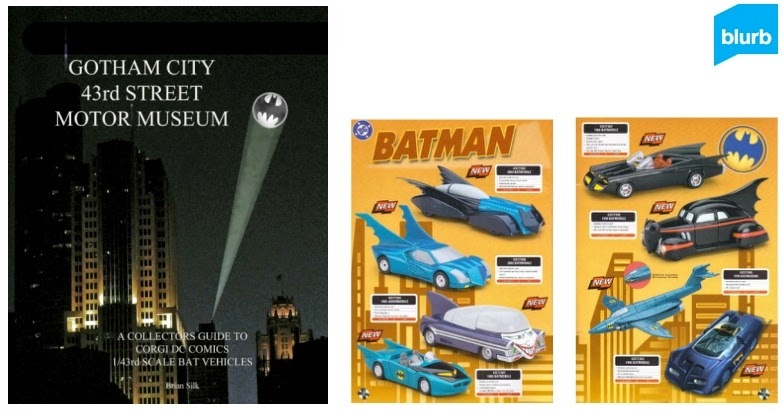 Here's an interesting book I came across recently that looks like it's a pretty cool reference guide for Batman Toy Collectors who love the 1/43 Scale Diecast Batmobile Cars that were made by Corgi Toys awhile back. Do you remember these? They were insanely great & I totally loved them. Well, I still do, maybe even a little bit more now. I remember, around the time these all came out (2004 to 2008), that my personal life was in complete turmoil and I could not afford to get them all and I wanted them ALL oh so bad. I do plan to slowly collect them over the next few years. They're really awesome! Anyways, BLURB has published a book that is a guide to these amazing toys. It measures about 8' X 10' with 72 full-color pages. It comes in both Hardback (approx. $35) and Softback ($21) versions. Now, to be honest, I have not seen the book in real-life so I'm not exactly sure how the quality is but if you CLICK HERE you can see a 15-page Preview and get some ordering information.